Combine every relentless hardass you’ve ever known, add a dose of supreme confidence and combat training, provide scary federal credentials, and put it all in one intimidating package topped off with a severe ponytail. The result? Katrina Armstrong, aka Spy Smasher.As written by Gail Simone in the Birds of Prey “Blood and Circuits” arc, Ms. Armstrong was your worst nightmare, and she blew into the Birds’ lives like a blonde tornado. Barbara Gordon is a hard woman to intimidate, but her former college frenemy took her to the brink by going after her team with big, government-certified guns. And by not-too-subtly threatening her dad, Commissioner Jim Gordon. In short, Spy Smasher is valedictorian of the Amanda Waller School of Ruthless Tactics. If you don’t follow her command, prepare to be tirelessly and vigorously hunted. Has anyone seen Wilkins' manhood? It's gone. Spy Smasher’s BoP entrance was unforgettable. Storming into the Pentagon, she immediately demanded that some poor bureaucrat – Deputy Administrator Fenton Wilkins — shoot down the Birds’ helicopter. He tried to reason with her later, but she (as they say in some circles) totally pulled his ho card in the sequence above. Oh, and when Wilkins wasn’t quick enough with the coffee, she pulled a gun on him. Katrina could have been a one-note villain, but Simone wrote the character as a intelligent, extremely capable woman who wants to win, period. She also had an interesting history with Babs. Both were gifted, fiercely competitive students at Gotham State, and they regarded each other with a wary respect. “Kat, not quite a friend, more of a like-minded and pleasantly cordial scorpion with just a smidge of unused venom.” Nicola Scott drew Spy Smasher as dangerously long and lean, with cheekbones that could cut glass. That damn ponytail was practically a weapon, and it reminded me of Madonna’s Blonde Ambition phase. I define a successful character as one who leaves you wanting to see more of them, regardless of “likability.” Spy Smasher doesn’t have a likable bone in her body, and I wouldn’t have her any other way. I don’t read Birds of Prey (even though I have considered buying trade paperbacks) but could this be a character that could carry her own title? I love this counter terrorism stuff a lot (James Bond, Mitch Rapp, Jack Bauer, etc.) and I could see myself reading the Spy Smasher monthly. She sounds fun. Ed, absolutely. She’s right up there with Amanda Waller, and if a good writer/artist team were on board, it’d be a hell of a book. Spy Smasher’s one-liners alone make the “Blood and Circuits” trade worth buying. Who was a scary adversary for BoP and the 100th issue confrontation with them was made all the sweeter from the build-up. She reminds me of Greg Ruka’s character from Queen and Country. I really need to read that. I liked this character, but I thought some more interesting things could have been done with her. First, I wish her relationship with Oracle had been more ambiguous. Why is she trying to bring down someone who was once her friend? Does she have any mixed feelings about that? I also wish she had been presented a little more realistically. 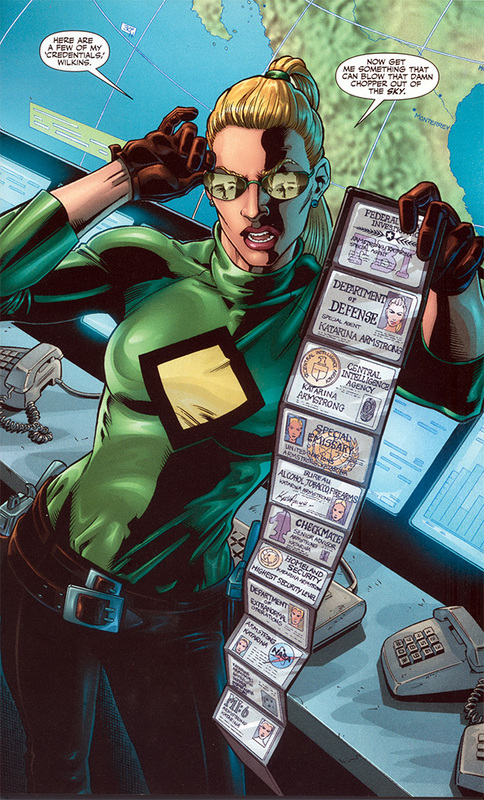 There’s no way anyone could belong to all the organizations she has ID cards for in that first scan, certain combinations present there would be illegal. I thought she would have been more intimidating if she had been presented more believably. I definitely would like to see more of her at some point, though. Spy Smasher is nothing if not over the top! I want to see her again, too.